Section 2 Division 2 Team 1: The giant from Okinawa. He is soft-spoken and kind-hearted. He wanted to join his father as a fisherman but easily gets seasick. He later joined the police force and eventually made it over to SV.2. Yamazaki's too large to fit in a labor's cockpit, so he is designated as the carrier driver for Unit 1. When not on duty he tends to SV.2's vegetable garden where his green fingers can be seen. 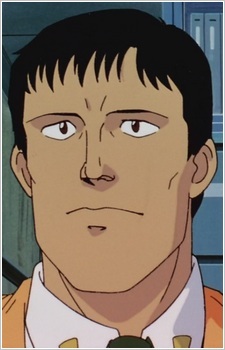 He's extremely strong, as demonstrated in Movie 1 and 2 where Yamazaki mans the massive anti-labor rifle borrowed from the Narashino Parachute Labor team (apparently an M82 anti-material rifle).